‘Paying it forward’ has always been a part of our business philosophy at LifeLab. Social and environmental responsibilities are part of good corporate citizenship. We believe that “business is good for development, and development is good for business” (World Business Council for Sustainable Development, 2002.) Based in South Africa, we are continuously challenged to play our part in social transformation. Positive Heroes is an educational, awareness and self-help action campaign that draws on the huge power that positive role models living with HIV have to change people’s responses, to a deadly epidemic of silence and shame. 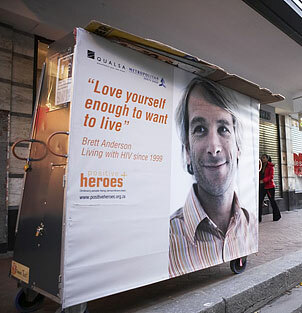 Brett Anderson-Terry serves on the boards of Positive Heroes and HIV360°, and as a Positive Hero himself, Brett aims to normalise the experience of living positively, bringing a message of hope, encouraging South Africans to prevent new infection, know their status and to apply strategies to live positively. Together with the Western Cape Department of Education and the International AIDS Prevention Initiative, Brett Anderson-Terry and Jeff Bosacki founded the School AIDS Awareness Week in 2000. 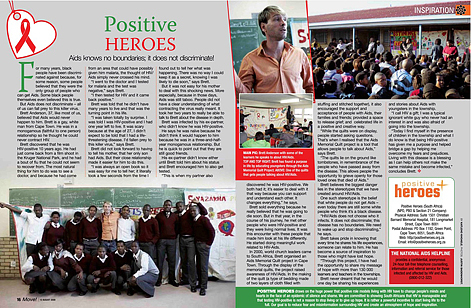 To date this program has brought a message of hope through sharing the stories of the Positive Heroes with over 130 000 learners and teachers.